It's been 4 months since my wife Helen, my daughter Sarah and I returned from our six day Grand Canyon trip with Western River but the memories we have of our time in the canyon are as vivid today as the day they were made. Our time on the river was one of those rare periods when all cares are set aside and all problems and distractions are put to rest. There is only the present and the awareness of the people around you in it. For Helen, Sarah and I to share in this experience, together and with each other, was a true blessing. The trip itself was part vacation, where our Guides, personable and competent, saw to our every need; part geology, anthropology, history and sociology field trip, where we learned and appreciated the structure and history of the earth, the canyon, it's peoples and the people who explored it; part adventure made up of wild andrenaline fueled rapids and hikes to ruins, hidden waterfalls and amazing vistas; and, part spiritual journey as we travelled through a place where time has moved so slowly, on such a massive scale, that our own journey was itself timeless. Our Guides provided for our meals and comfort, saw to our safety and gave us an appreciation of what we saw around us. They were fun, knowledgeable, talented, and well rounded people. Though they must lead this trip many times each season, they were so focused on us and our raft-mates that we all felt as if we were their only group of the summer. Everyone at Western River was pleasant and helpful before our trip and provided a tremendous amount of help and guidance in our preparations. And, they're nice in person, too: we had the good fortune to travel with some of them on the other raft as they did a vacation of their own. How great is that when the people who help make your trip possible love to take the same exact trip themselves? There is not a single aspect of our trip that I could wish could have been any different, other than it have been longer: and that's what just about defines it as perfect. So, I guess to try to state it more simply: there are a great many things that are described as being "of a lifetime", but I say with great assurance that our trip was truly one of those trips-of-a-lifetime. 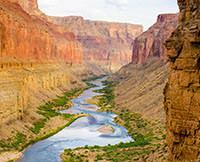 I am absolutely sure that, God willing, we will return to the Grand Canyon again with Western River. It is one of the best places for family vacations. I look forward to that day. Still, I confess to a little bit of envy for everyone that has yet to go for their first time.